Hard Choices, by Hilary Rodham Clinton. Simon and Schuster, 10 June 2014. In an era of risk assessment and parsed avowal, memorable political memoirs tend to strut, rather than tiptoe. Hard Choices does neither, sashaying past crises with measured grace (or is it calculated resignation?) and pirouetting around presidents past and present. That's a deliberate choice, I'd say, as the prospect of another Democratic nomination/presidential campaign for one Hillary Rodham Clinton means her dance card's far from full. This was akin to reading a carefully vetted resume. 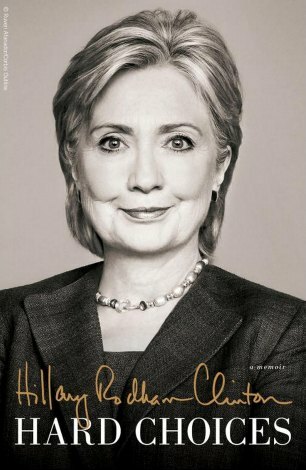 An intelligent and formidable first lady, senator and Secretary of State, and no shrinking violet (as the Clinton family's dramas have shown), the author presents a largely passionless, desiccated record. There's the odd poignant reflection. Absurd depictions of Mel Brooksian secure rooms (and the reading of documents with a blanket over her head in non-secure rooms). But, overall, Clinton draws pictures without drawing blood. Readers gain atoms of insight as she and Bill take long nature walks and chat. They watch a movie with Chelsea. Hillary sidles alongside Bono to tickle the ivories at a private function held after Nelson Mandela's funeral. Adoring university students ask the Secretary of State adorable questions. Policies emanated respectively from, in the author's offhand phraseology, 'Obamaworld and Hillaryland'. These fiefdoms were run respectively by the president and by his 'chief diplomat ... principal advisor on foreign policy, and the CEO of a sprawling Department'. You could be forgiven for wondering who made the big calls. It's an occasionally illuminating but disappointing canvass; a sometimes mawkish result for a person of intellect and vision who's inspired and divided millions, if not billions. Perhaps I was naive to expect anything more forthright. A formula ensues in the selective retelling: hubris, 'ethics vs national interest' discourse, and manifest destiny. Atrocities, dictators, American power and prestige. Allies, creeps and gaffes; wins, evasions and losses. Sticky diplomatic situations are resolved or dismissed, as the author works her 'Smart Power' magic (military might plus financial/diplomatic/legal/cultural muscle). Sometimes, she notes, acting ethically is prompted by the desire to not lose face. Enter famed Chinese 'barefoot lawyer' Chen Guangcheng, a blind human rights advocate who 'was injured, on the run, and asking for our help'. It's one of several engaging retellings of dramatic events. Paradoxically, Clinton contends that 'even more than our military and economic power, America's values are the greatest source of strength and security' while noting that 'our credibility was on the line'. The eventually happy ending for Chen and his family comes with Clinton's realpolitik observation that 'if we didn't help Chen, it would undermine our position everywhere'. Coming in at more than 635 pages, Hard Choices is more Easter bonnet than hardhat. It's clear she's not yet thrown it into the electoral ring (she wraps up with the observation that 'the time for another hard choice will come soon enough'). Strategic as ever, she's placed her bonnet in clear sight, to keep her spot warm. It's telling that Hard Choices begins with defeat (that is to the current 44th US President Barack Obama), isn't it Barry? Here, our heroine seems to be playing her vulnerable card. It's something we can all relate to, right? Putting in the hard yards only to be pipped at the post. From her diplomatic skills to her famous designer pantsuits, Clinton certainly hasn't shied from doing just that. But if, dear reader, you were looking for something far-less inscrutable (the internal monologue between her ambitious and pragmatic side after being offered the appointment of Secretary of State from President Elect Obama, for instance), then you'll be sorely disappointed. Yes, much of Hard Choices is a thinly veiled PR spin that, as Barry reminds us, serves a unique purpose of reminding us that Clinton's ambassadorial skills have long been in the making. Forged in the media glare of her husband's public peccadillos, Clinton's ducking and weaving has also come in handy during scandals of her own making (disingenuously both she and Bill recently begged poor, saying that they left the White House skint). Yet remaining immutable, level-headed and — most importantly — charming in her role as Secretary of State means Clinton has garnered considerable kudos. So much so that she can now add the string of elder stateswoman to her bow. Clinton's star power was clearly evident during her arrival in Australia last week to spruik her book. But so, too, was her fighting spirit. Critising Australia for 'becoming overly dependent on China as a trading partner while expecting Washington to defend [it] from a Beijing that is becoming more aggressive in the region', as Fairfax reported, Clinton showed that despite resigning from her position last year, politics remained firmly on her mind, as well as squarely in her sights. Of course, she's being disingenuous expecting us to swallow the line that she hasn't, as she writes, decided whether or not she'll be running for president in 2016. But, as the fall-out from former Australian prime minister Julia Gillard's famous 'misogyny speech' (and which Clinton is a big fan of) showed, women in politics still can't afford to let down their guard. Not for a second. And if Clinton is determined to go another round for US presidency, then she'll once again have to decide whether or not to put a lid on that fallible, all-too human side of hers. Not a matter of choice, perhaps, as much as of necessity. Poor Hillary. She misses out on the Presidency, and now this! Although she can still count on being formidable and intelligent - as well as disingenuous. And I do like her necklace in the photo! Hilary Clinton is, I think, at least as able as Bill as a politician. In any genuinely egalitarian society she may have been allowed to have first go for the White House. The USA is not Scandinavia so it didn't happen. Interesting a black man (definitely not your average Afro-American: Obama has white slave owning ancestors rather than black slave ones) made it there before her. Obama was an "acceptable" Afro-American. Hilary needs to be an "acceptable" woman. She therefore needs to appear like Judy Garland in the films rather than like Katherine Hepburn in real life . Hilary is more like the latter: intelligent, feisty and very much her own person. She is certainly capable of writing her own autobiography. Where I would worry about her as President, as I do about Obama, is that I think we in the West are terribly naive about areas such as the Middle East and South Asia. Our "friends" there, like the Saudis or some former Iraqi exiles, tend to inveigle us into getting involved in areas we would do well to stay out of. I have to imagine what it would be like to be a refugee, to have fought the sea for safe loam, to starve while salt eats the ship, to thirst for fruit back home, to plea for life and water, to grow sores and wipe blood from our daughter's mouth. But no imagination is needed to witness ice and spit from an ignorant mouth ... I have known and have seen faces contorted like knuckles with hate; feet planted to fight for their version of country. Ensconced in the anonymity of the confessional, a man who suffered injustice at the hands of the Church informs the priest, Fr Lavelle, that he plans to kill him. The killer's reason for wanting to inflict violence is that he was, as a child, a victim of abuse that went unpunished. Lavelle is not respected by his parishioners, despite the centrality of the Church to their community. Amid the ruins left by the abuse crisis he carries little moral authority.